It is thought that the origin of Derby may belong to prehistoric times and developed as a strategic point on the River Derwent, where it was possible to cross it by ford. 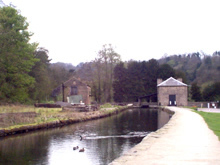 The Derwent was renowned for flooding which made the river impassable and so the travellers and merchants congregated and eventually settled on its banks. In the 1st and 2nd centuries the Roman armies controlled the area and established their stronghold at what is now known as Little Chester. Two centuries later the Romans left and the area came under the rule of the Saxons, as part of their Kingdom of Mercia. The Saxons developed this area having created a settlement nearby, which is now known as Markeaton. Many local district and road names date back to these early times. Facts regarding Derby collected by the commissioners of William the Conqueror are recorded in the Domesday Book. Large areas of land of what now constitutes Derbyshire and Nottinghamshire were granted to William Peveril. This land was latter passed to the crown following the disinheritance of his son for having poisoned the Earl of Chester.